Air Web is a Web browser with advanced options, controlled by your iPhone or iPad. Air Web is the perfect tool when you don't want to sit on your computer just to browse the web. Connect your iPhone or iPad with AppleTV and start browsing the web. You will have a bigger screen and a smaller controller at the same time. 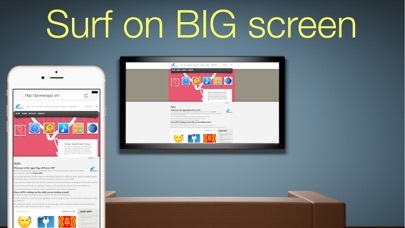 Convert your AppleTV into a full fledged web browser now. All you need is Air Web! I can't get simpler than that .... you should try it! Drop us a line for feedback or suggestions. And do not hesitate to give it a good rating if you like it!